As you can imagine, being based in the Arab world, we are smack dab in the intense desert heat. We are talking temperatures ranging from 115-122F (41-50C). Yes you read right. Of course, people often overcompensate by having icy cold buildings and malls. It was the yo-yoing in temperature that struck the steward with a really bad cold recently. Somehow the chef handles the high temps better (maybe due to the heat of a restaurant kitchen). Since we are staying away from antibiotics (unless medically necessary), we have been using prebiotics and probiotics to treat minor illnesses. So in addition to daily doses of natural immune boosting herb, echinacea and natural Olbas Oil inhalation therapies and Sugar Free Olbas Pastilles, we made a pot of soup everyday. 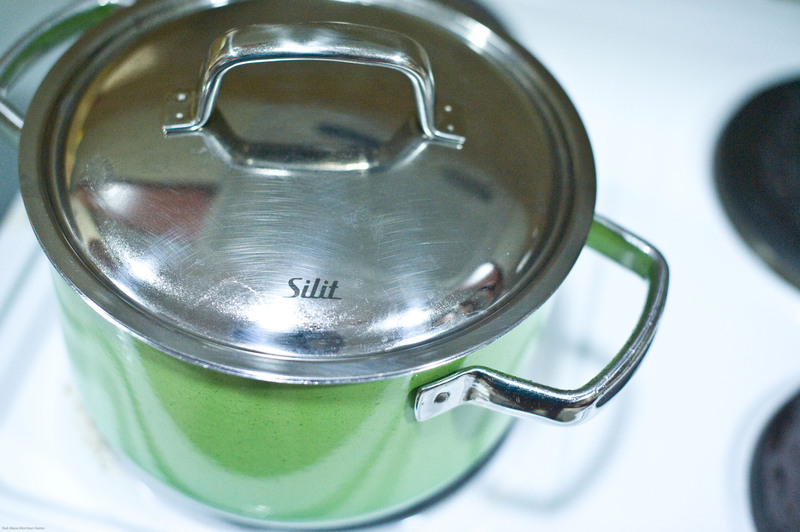 It may have been our brand spanking new Silit pot from Tavola, which we got in the cutest shade of green, but soup it has been everyday for 4 days straight! Nothing like a new tool to motivate even the sick among us! METHOD: Season Chicken with salt and pepper and allow to marinate if possible for 30 mins. Heat Coconut oil in pot. Add chicken and sear on both sides to carmelize and get some colour. 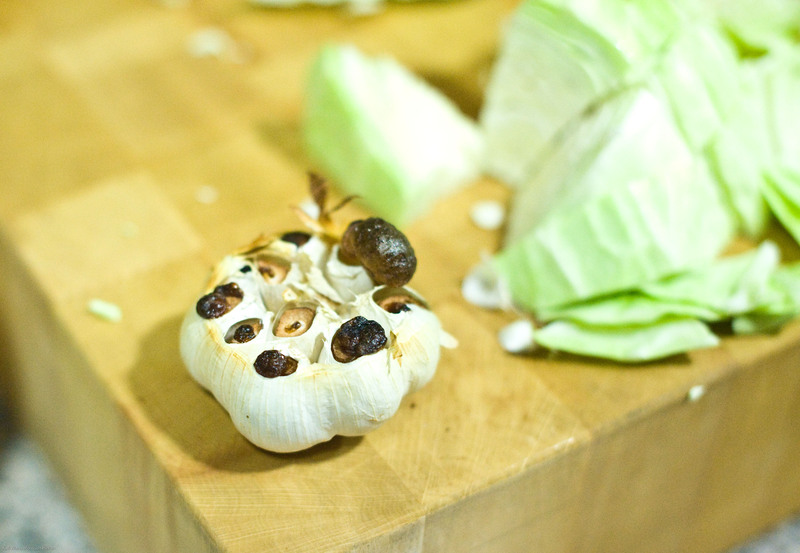 Chop off just the tips of the cloves in the head of garlic. 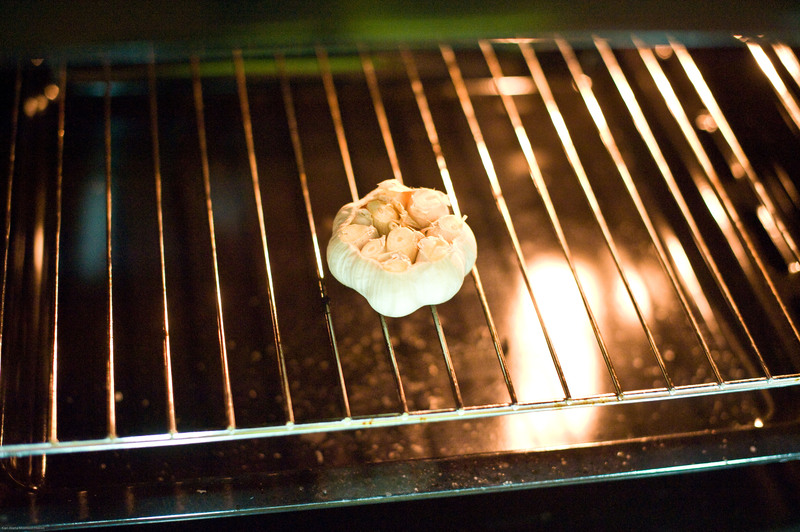 Place garlic in oven at 180C or 350F. 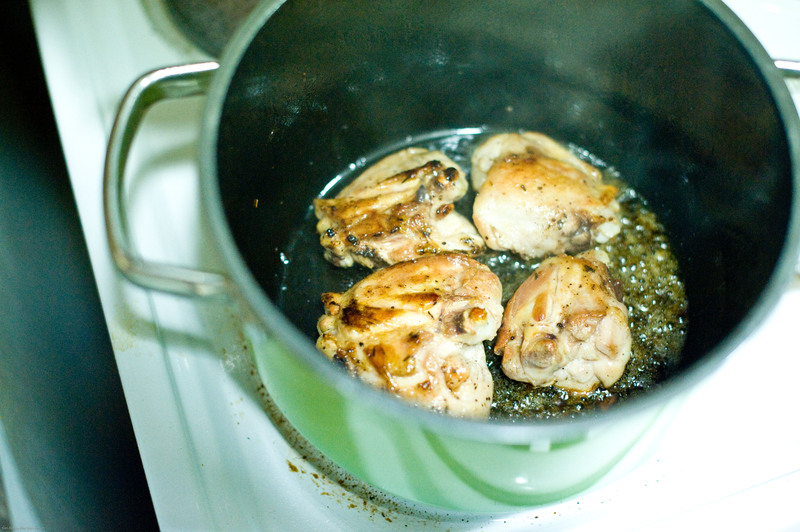 When chicken is browned, add chicken stock, then top up with water and cover. 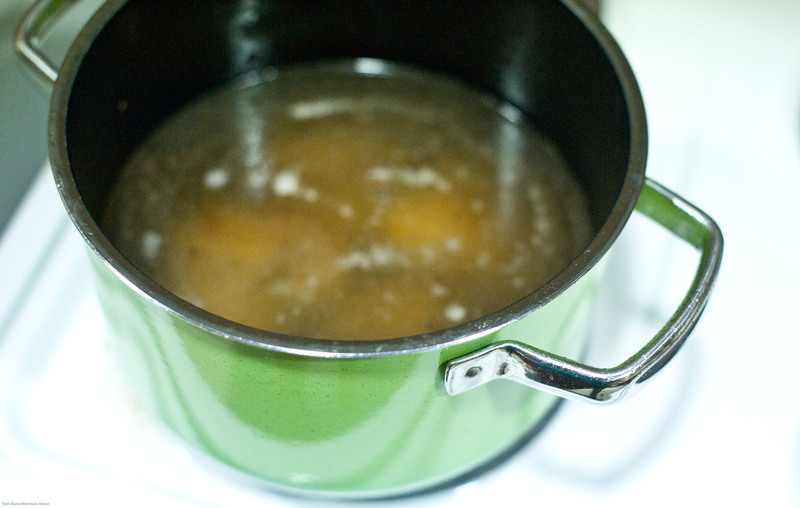 Bring to a boil and then reduce heat to a simmer. Cook for about 40 mins. Chop cabbage. Check on garlic. When it starts to loosen and you see the cloves coming out in a puree form, it is done. 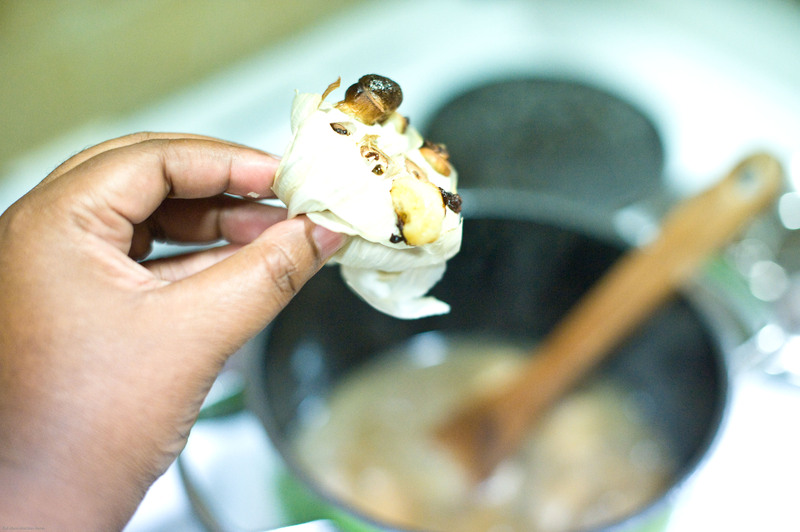 Squeeze garlic into pot with chicken and stir well. Add cabbage. Top up with boiling water. Add green onions. Taste. Adjust salt. 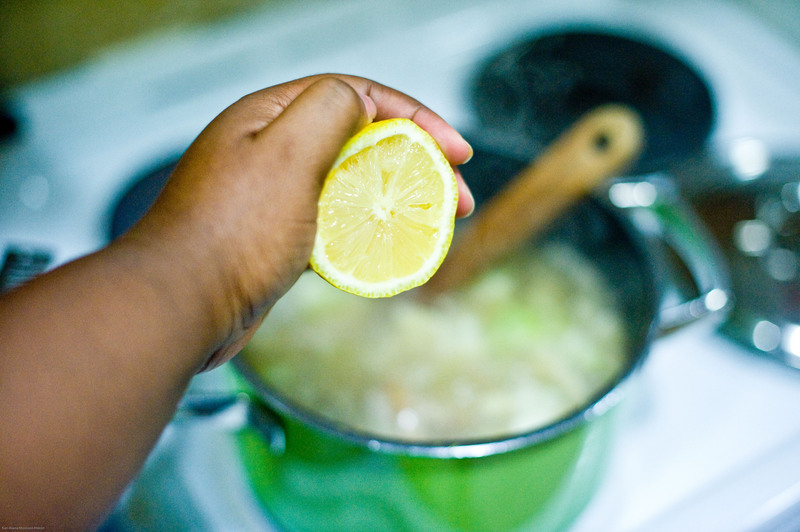 When cabbage is cooked, squeeze half a lemon in pot and remove from heat and serve. Makes 4 servings. 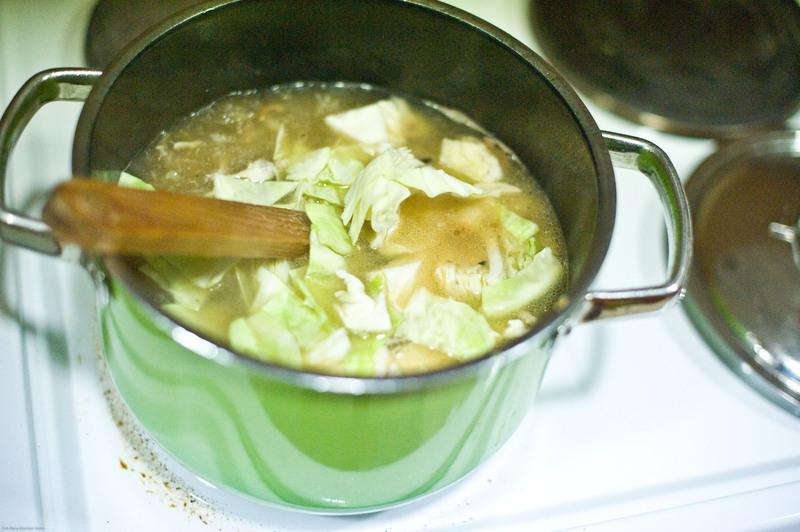 STEWARD’S NOTE: Garlic is a natural antibiotic and both cabbage and lemons are high in Vitamin C. This is supposed to be a salty and tangy soup that is a relief for sore throats and heavily congested sinuses. Coconut oil is also high in antioxidants and has antibacterial properties and has been used in traditional societies to treat flus and colds for hundreds of years! Flu, better beware! CHEF’S NOTE: There is a nice balance of flavours in this soup, which has a broth-like consistency. One entire head of garlic may seam like a lot for 4 servings but roasting it takes out the sharp garlic taste and releases the natural oils. 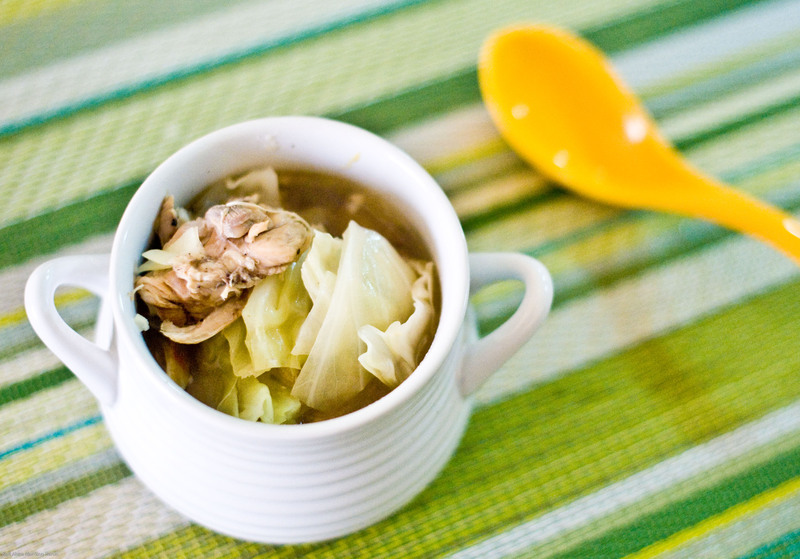 In the end, you have a hearty soup with a mild garlic flavour that is not only quick to make, but cheap on the pocket and very healthy. Yummers. 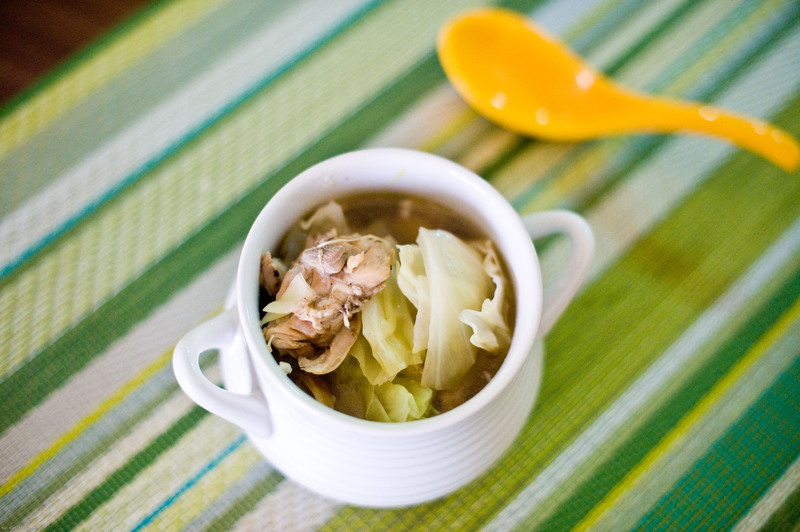 I will borrow this recipe whenever the hubby has a cold or flu, plus he loves soups. I also like the simplicity of it. So simple and filled with goodness. Thanks for sharing. I might very well be making this soon. Fluctuation in temperature here in Toronto… (from mild to cold to very cold) has be slightly under the weather. This will do the trick, I’m sure! This will definitely do the trick.. For added cold-relief, chop up some raw garlic very fine and swallow with a little water a few times in between this soup! Thanks much love. We try our best to deliver value to our readers! Wish I had found this earlier this week when the flu had me knocked out! Thank you for this recipe. I will try it out tomorrow. I buy a whole chicken, just for soups. I use the back and wings for the stock. Will try out your version. Louise you can use any part of the chicken you like!